This was just a tiny crack months ago. I tried fixing it with glue, but now it's a canyon. This headset has tiny cracks everywhere caused by just using it alone. Can anybody say "hardware defect?" or do I just have a fat head? With that said, I won't be able to record and will be looking for somebody to fill in for me until I can find a resolution to this problem. The next Showcase is ready to do the moment I can find somebody to temporarily fill in on the recording aspect for me. Welcome to the club! 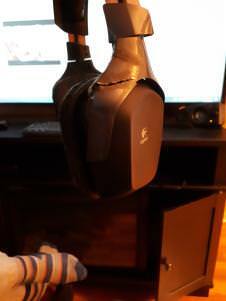 My headset broke back in December or January, otherwise I'd offer to do it. I do technically have access to a mic, but I have to hold it, so I can't really play stuff with it. You could always ask zeldaclassicidiot to do it. My new headset came today, so I'll be resuming the showcase tomorrow more than likely.